The buildings, bought by Betesh’s Milestone Equities in 2013 for $62 million, are mainly filled with low-income Chinese families living in rent-stabilized apartments. 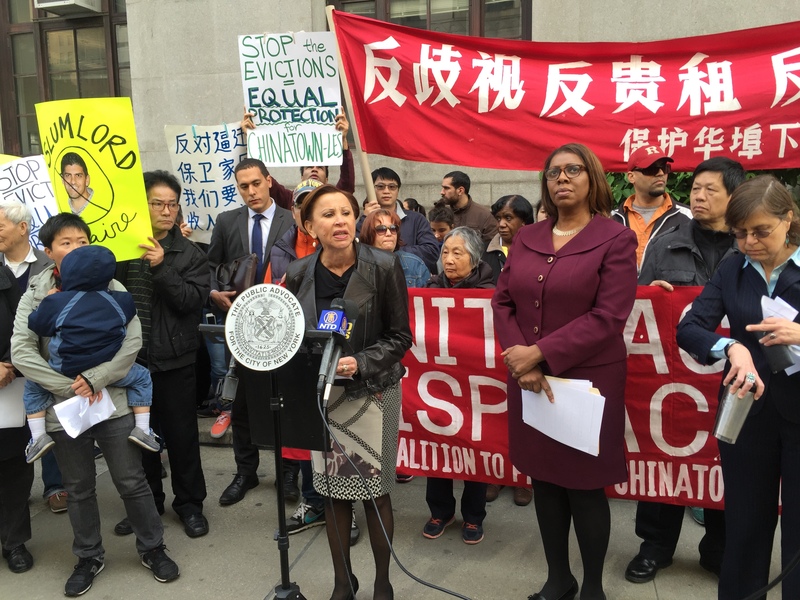 Last March, Betesh refused to renew rent-stabilized leases, arguing that the building was not in fact rent-stabilized because it underwent substantial rehabilitation. But when that didn’t work (they dropped a court case against one of the residents and paid his legal fees) they seemingly changed tactics–now they deemed the building “structurally unsound” and ordered all the tenants to vacate. The tenants agree that repairs are needed–they complain of slanting floors, broken windows and leaking ceilings. The Department of Buildings database showed that the first-floor rear extension at 83 Bowery had deteriorated, with a structurally deficient rotted wooden joist. It also cites failure to maintain plumbing materials and work without a permit in 85 Bowery. The city has ordered the commercial parts of both buildings vacated (the sections that are likely a big part of the attraction to buying a $62 million mainly rent-stabilized tenement in a rapidly-gentrifying area) but not the residential apartments. An engineer hired by the tenants says they don’t need to leave in order for the work to be completed. And if they leave, there’s little guarantee they could come back, especially–as we’ve seen time and again–if the landlord argues that costly repairs to the building allow them to bump apartment rents up to market rate. 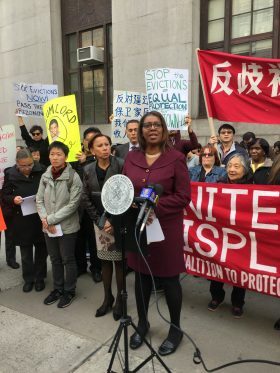 So they’ve joined together and fought back with rallies and legal counsel, garnering press coverage many buildings suffering from landlord harassment don’t get. At the court hearing today, Betesh (who did not attend) hoped to convince the judge that the building was dangerous and unsound. But he was in for a lot of pressure to reverse course or alter his efforts to force tenants to vacate the buildings permanently. James didn’t just lead the rally–she also served as co-counsel to defend the families in danger of eviction, along with Janet Ray Kalson, the tenants’ lawyer. Given James’ forceful words, some expected to see a showdown in the court room. Instead, in a surprise move, Betesh’s lawyers announced they would work with the tenants on a settlement to temporarily relocate them while the repairs are made. Under a new agreement, the landlord would provide the tenants with a stipend to cover the time away, and move them all back in with 99-year-leases. But, she conceded, “the devil is in the details.” There are still many aspects that need to be worked out in a new settlement before the next hearing on June 15. “We’ll have to see if this works or not,” she said. “Obviously, the amount of the rent is a very important consideration. It has to be affordable for the tenants.” Though the apartments would remain rent regulated, there will still likely be a rent bump due to the improvements and it’s not clear yet how high that might be. Kalson added that she had represented clients who achieved similar results after elected officials and the media applied extra pressure. She has also seen cases where tenants were successfully returned to apartments after being temporarily moved out. “I see landlords settling these cases when the heat is hot enough,” she said. Correction: A previous version of this article misstated “substantial rehabilitations” as “capital repairs.” It also said Betesh lost a court case against a resident—in fact, he decided to drop it and was ordered to pay the defendant’s attorney’s fees.